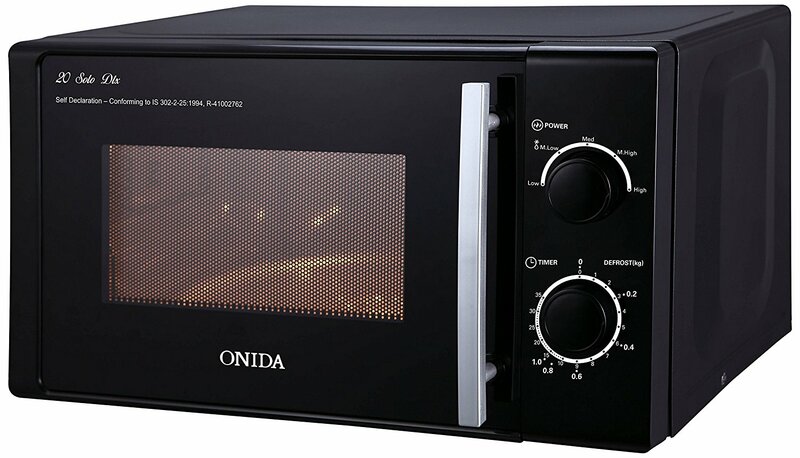 Onida makes uniquely designed microwaves with amazing performance, Onida 20 L Solo Microwave Oven (Power, Black) has impressive features that will surely facilitate easy and fast cooking at home. This 20 liters capacity microwave oven delivers 700 watts of cooking power to reheat and cook foods evenly. Further, it has 5 power levels providing you with customized cooking options to cook varieties of food. Using the express cooking feature, the cooking can really be very fast and easy without any doubts. Amazingly, this Onida solo microwave comes with one year of warranty and other components such as an instructional manual, customer care list and guarantee card. It also features speed defrost by time and handle controlling door for all your cooking ease. And the cavity is really very easy to clean and produces evenly-prepared meals.